Save anything that crosses your mind and store all useful information with the best free Android note taking app. 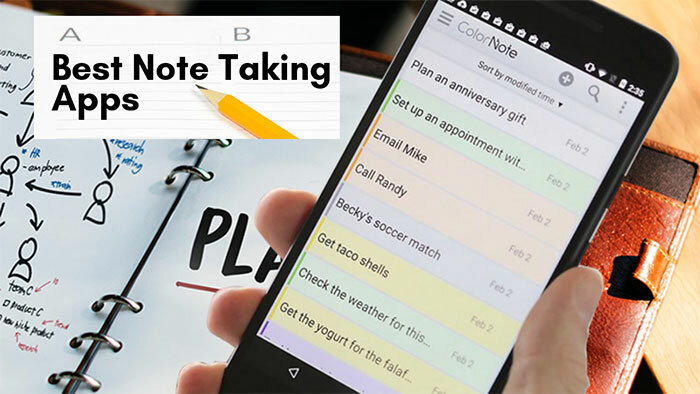 best Free Note taking appsThere are many applications available on the Play Store to create notes with your Android device. Most of them equipped with very user-friendly features that allow you to make notes, sort them, and always keep on hand, and sync it with other applications. To help you organize yourself, here we made a list of best note apps, suitable for adding personal notes, endless shopping lists, lists of things that you need to take a trip, to-do lists, etc. Evernote is simply one of the best note capturing apps for Android that allows you to do almost everything within the application. You can use this app to write any kind of note, also for recording voice notes or store pictures if they contain text that can be recognized by the OCR servers for future searches. You will also be able to organize your notes, tag them, make them do lists, reminders, and more. With its cross-platform integration, store your files in the cloud and access them from any of your mobile devices, and background note-taking capabilities, you can use this app for anything. LOOKING FOR BUSINESS APPS ON THE GO? OneNote is the application of Microsoft dedicated to taking all kinds of notes. OneNote allows you to create up to 500 text notes or images, can be added from your gallery or directly from the camera of the smartphone. The application also supports traditional lists accompanied by the usual checkboxes and to add formatted text and hyperlinks. All your notes in one place and with you, anywhere. Type or jot down notes, record audio or snap a picture and OneNote saves it. Your notes sync across your devices so you can access them wherever you go. With Simplenote, you can create simple notes, tag and set the notes to appear on the top of the list. In the navigation bar, you can see all the notes or filter by tags, and use their search engine to locate a note. If you have an account with the service, you can enjoy the synchronization between all your devices through its application for Android, iOS and web version. The application is very easy and simple to use. Google Keep is a notebook and organizer from Google that provides a possible way to take notes in Evernote style. Write down your thoughts, objectives or goals, set reminders or store a variety of photos, pictures in one place – Google Keep. To quickly access the service, you’ll find a widget on the desktop of your phone or tablet that enables you to create quick notes, lists, notes using voice recognition (audio per note) or capture notes with your device camera. A service that stands out for its simplicity and effectiveness, and also has an elegant interface, based on the “Holo” standard set by Google. Love hashtags? Then you will enjoy this app since you now have the opportunity to use them to sort your notes in Fetchnotes. Fetchnotes allows you to make lists of scheduled cases and take notes, and then bind them to different hashtags. You can get all the notes associated with one hashtag. It’s simple and surprisingly powerful. GNotes is an application for creating notes on your device, and at the same time organizer. GNotes easily synchronized with your Gmail-account. GNotes has many functions, including the creation of drawings. You can add notes to the audio or video and sort your notes by priority. GNotes supports many different file formats and allows the user to choose between the submission of a list or as icons. GNotes has an elegant, minimalistic interface that allows you to create folders and organizes your notes. A very responsive, fast, accurate, easy to use app for taking notes. The folder feature is great, as is the way that you can arrange the folders in the order you want. Very beautifully designed private journal app that offers high-speed access. Every journal and file written and attached in SomNote will be synced automatically after you log-in. SomNote will keep everything you write safely even if you initialize or lose your mobile. ColorNote is a simple and awesome notepad app. It gives you a quick and simple notepad editing experience when you write notes, memos, e-mails, messages, shopping lists, and to-do lists. You can organize notes by color and use a feature of sticky note memo widget to put your notes on your home screen. FiiNote is the most convenient note app. It is designed for both Phone and Tablet featuring a unique hybrid model for combined handwriting and keyboard. The app supports text, paint, handwriting, importing media files and many more useful functions. The app even comes with a built-in recorder app. A simple and beautiful app for taking notes and tracking todo-lists. The app is completely free to use. You can set reminders at a certain time, with optional repetition at certain days of the week. It also has Integration with Android Agenda Widget and multiple themes. What else could we ask for, as now we can take handwritten notes naturally on our tablet or phone? With Squid, you can write just like you would on paper using an active pen, passive stylus, or your finger. Organize your notes within notebooks and increase your productivity. A very well resolved application for taking handwritten notes with a stylus or your finger. The application allows you to write, draw or make notes with your finger on a phone or tablet. Moreover, it is possible to undo the writing or re-enable it while others draw on various functions in word processors such as font size, font color, different thicknesses for the stroke, export to PDF, email or share with Evernote. This is a very simple app to manage your notes. Very fast. No annoying bugs and great graphics. Get it today to get your work in order. LectureNotes is an app for note-taking by handwriting on the screen, in particular with a stylus. It has been designed for students or lecturers who are using it for taking handwritten notes during a lecture. Preserve your bank accounts, e-mail accounts, any passwords safe in here. Note searchability, Limitless notes & Different themes, colors and fonts can be changeable. Backup passcode with a secret question. This is help like one of your diary or a private notebook. You can write on all the notes to remember and research notes without the need for internet connection. You can lock all your private notes with a password. Adjust the text font color used for notes or diary making. Control the text size used when taking notes. Spell check text of your notebook and dairy. A large number of note saving apps are available on google play store but, these best free apps are powerful enough to handle all your note-taking demands. Download them and try out on your device then decide which one suits your need. Did I miss out any of the note saving app that should be mentioned? Well, you are always welcome to share the name. showboxfreeapks is using Hatena Blog. Would you like to try it too?